ENGINE. " 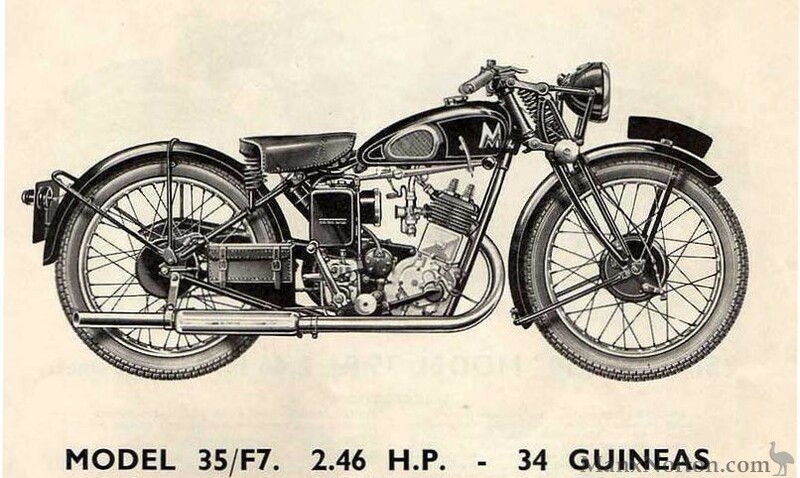 Matchless " 2.46 H.P. high efficiency four-stroke side-valve, with enclosed valves. Decompressor to ensure easy starting. Bore 62.5 mm. Stroke 80 mm Capacity 246 c.c. LUBRICATION, "Matchless" dry sump system with pressure feed to all working parts, and fabric oil filter. Cycle parts lubricated by grease gun. GEARBOX. Pivot-mounted three-speed gear with clutch and kickstarter. TRANSMISSION. By chain throughout. Front chain automatically lubricated from engine. STANDS. Spring-up centre prop stand. Separate tubular stand for front wheel. TANKS. Bulbous saddle tank for petrol : capacity 2 gallons. Separate oil tank under saddle ; capacity 3 pints. FRAME. Unbreakable duplex cradle frame of great strength. SPRING FORKS. Compression spring type with adjustable shock absorbers. BRAKES. Internal expanding on both wheels with finger-adjustment. MUDGUARDS. Wide mudguards, front and rear. Rear guard detachable to facilitate tyre repairs. SADDLE. Lycett "Aero" spring seat. TYRES. 25 in. x 3 in. Cord. LUGGAGE CARRIER. Detachable luggage earner, 15/- extra. HANDLEBARS. Graceful semi-sports "clean" handlebars with integral fittings. Black finish. ELECTRICAL EQUIPMENT. "Lucas" six-volt electric lighting and coil ignition system Large size dynamo, giving 30 watts output, rigidly mounted on engine places and driven direct from crankshaft by roller chain, lubricated by adjustable oil feed. Accessible adjustment provided for chain tension. Contact breaker built into engine timing case. Lighting equipment consists of 6 in. diameter head-lamp with parking light and with dimming switch on handlebar ; Lucas tail-lamp mounted on rear number plate. The switch, ammeter and warning light showing when ignition is switched on are mounted on the back of the head-lamp. Extra large battery carried on special platform beneath saddle. Electric horn. FINISH. Petrol tank finished in glossy black enamel with gold lines and chromium-plated embossed " M " on each side. Chromium-placed strip down centre of tank top. Frame, mudguards, handlebars, etc., stove-enamelled black after special anti-rust process. Wheel rims and all bright parts heavily chromium-placed. MAXIMUM SPEED. 50-55 miles per hour. TAX. Annual Tax in Great Britain, £1 . 10 . 0 per annum. With 4-speed gearbox and oil-bath chain-case, 10 6 extra.